This is the third and final release in the 2nd Step Collection from Box Whisky. This is a limited release, just as the two previous releases. The Box Whisky The 2nd Step Collection 03 came on sale on 2017-04-06. See here for a ton of extra information and facts on this release. 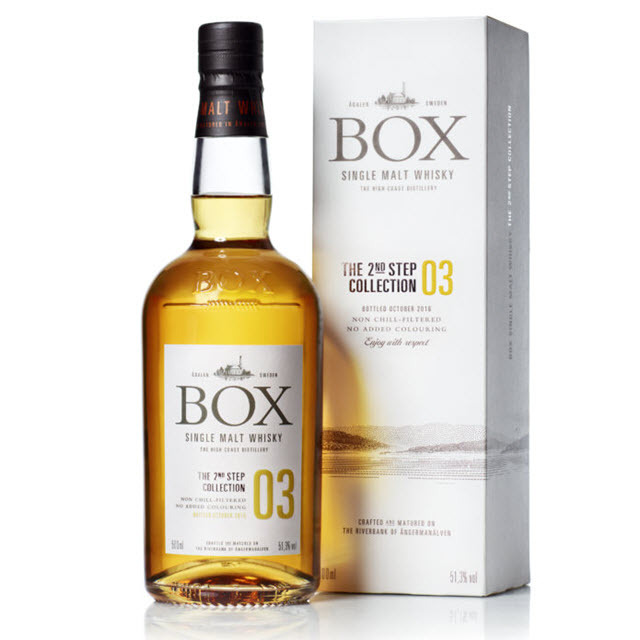 You can buy the Box Whisky The 2nd Step Collection 03 in Sweden at SEK 743 (9132202). Hopefully we will see this whisky launched in Norway sometime later this year. Nose: Powdered sugar sprinkled over tinned pears and apples. Simple syrup, vanilla and thick wood smoke. There's a strange spiciness here, that I cannot quite place. Very nice nose, though. Taste: Medium body and a dry, almost chewy mouthfeel. Minty ashes! Intensely minty and green, and intensely ash-like in character. The peatiness is not that well integrated here, it is sort of standing on its own - separate and apart. It is not all that easy to get a grip on other aromas here, except for he before mentioned mint. Mouth water and white pepper. The 'strange' spiciness is here as well, and I still cannot place it. Finish: Medium long finish. The mintiness is now bordering on perfume-like. It certainly is fresh. Towards the end it feels like I'm chewing on a twig from a fir tree. The peatiness is now toned down, but very much still a presence. Comments: Loved the nose, not all that enthralled with the palate. I found it a bit heavy-handed.